Originally designed to create a bit of publicity for a sales event we were attending this range of self standing frames has evolved into a very nice and effective product. Available as either three or four legged they have a variety of uses. 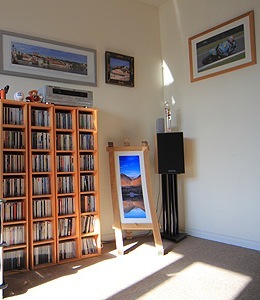 The addition of another stave and a hinge converts the barrel frame into a freestanding tripod frame suitable for use with one of our portrait panoramic images and look really good sitting on the floor of any room in the house. The tripod frames are normally supplied as convex (sticking out) but can be concave if desired as pictured below. 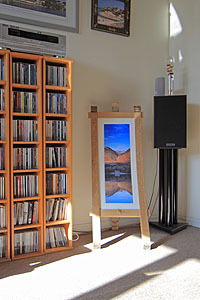 The four legged frames are double sided convex structures made from four whisky barrel staves and are suitable for inserting more regular sized photographs and the quadropod frames can even display two images back to back, but note that due to the size of the staves they work best with photos of 12 x 8 inches or larger The good news is that we can easily enlarge your images to make them suitable. 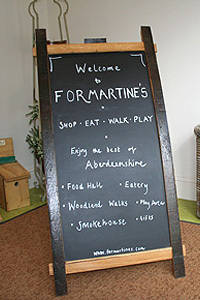 A variation on the theme are the blackboard displays. These are tripod or quadropod frames fitted with blackboard display material that can be used with chalks and then wiped clean to be used again and again. Available as single or double surfaces their height depends on the type of barrel staves used but normally stand around 40” high. 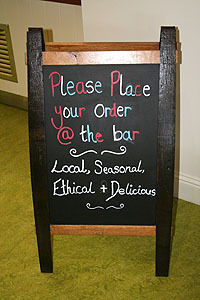 These unusual but highly distinctive self standing “A” frames are robust and ideal for displays in pubs and restaurants. Because of the diversity and varying length of whisky barrel staves a range of options is available. If you are interested in this service please contact us or email your photographs and we will advise on suitability and cost.